In the bowels of the Xcel Energy Center Friday afternoon, Dave Langevin couldn’t help but reminisce about his other favorite hockey experience — hoisting the Stanley Cup over his head 30 years earlier as a member of the New York Islanders’ dynasty. It was a true life-altering moment, but one that has faded over time. He’s now ready to add another, newer memory. The first-year Edina assistant coach had just helped his second-seeded Hornets dispatch Roseau in the state Class AA quarterfinals, Langevin’s first direct involvement in the state tournament since winning two private school titles for Hill-Murray in 1970 and 1972. He described his return as like having grandchildren. “This is bringing back the emotions of what I went through in my career,” Langevin said. “It’s so much fun at this tournament. You test yourself to see what you can handle, the pressure, the challenge of the other team trying to beat you. Always a competitor, Langevin, who won four Stanley Cups with the Islanders in the early 1980s, wouldn’t mind capping his state tournament return off with another victory lap around the rink. But only for his players. Just a few years ago, Langevin never thought he’d be in that position. After his playing career ended, he coached minor league hockey briefly, but retired from it soon thereafter. Or so he thought. 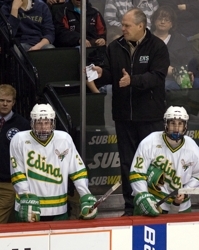 Edina head coach Curt Giles first asked him to join the Hornets’ staff four years ago, but Langevin had another hockey job in the pipeline – coaching his daughter Anna for the Henry Sibley girls’ high school team. He accepted that position, but still kept an eye on the Hornets’ situation. Giles and Langevin are old friends and their ease with each other is evident. They first crossed paths as teammates at the University of Minnesota-Duluth in 1975. Giles was a 17-year-old freshman from the historic fur-trading area of Manitoba. Langevin was an experienced senior from the Twin Cities. But a mutual respect was born immediately. A few years later, Giles and Langevin were reunited on the blue line for the NHL’s Minnesota North Stars – after Langevin had already won his four Stanley Cups rings as a hard-nosed defenseman with the Islanders’ early 80s dynasty. The pair combined to play 1,624 professional games over 25 seasons, although neither is certain their players know quite how much professional hockey they played. Giles remembered, though. He knew Langevin’s competitive nature and tabbed him as a natural coach, one who could work wonders with Edina’s young defensive corps this season. Over the summer, Langevin took control of the Hornets’ defense while Giles focused on the offense. They built the team system, one which has led the underrated Hornets further than last year’s star-laden group, on their combined hockey knowledge. One that stresses defense, but doesn’t want to remove offense. “There’s kind of a fallacy out there that if you play good defense, that you have no offense,” Langevin said, explaining that every player in the Hornets’ system has a defensive role, which feeds directly into a quick transition offense. “We know that if you keep the team out of your zone and take away the scoring chances, that we’re always in the game,” Langevin said. Another NHLer stands directly to Langevin’s side on the Edina bench, former goaltender Don Beaupre. He played 17 seasons, mainly with the Minnesota North Stars and Washington Capitals, winning 268 career games. Naturally, Beaupre works with Connor Girard and Johnny Ankeny, the Hornets’ two netminders. Interestingly, Edina wasn’t the only coaching staff with a load of NHL experience in Friday morning’s tilt. While the Hornets had a pro defensive presence, Roseau featured some true snipers on its bench in Bryan “Butsy” Erickson and Aaron Broten. The former Rams teamed up on the powerful Roseau teams of the late 1970s, leading the school to three straight state tournaments. Later, they played in the NHL for a combined 19 seasons. Erickson finished with 205 career points, while Broten had 515. Rams’ head coach Andy Lundbohm, a 1995 Roseau graduate, also played four years at Army (168 points) and spent four years in the minor leagues.